Omantel announced the launch of its first 'Sustainability Report' at a special gala event yesterday that was held at Omantel headquarters under the auspices of Yahya bin Said Al Jabri, chairman of Special Economic Zone at Duqm (SEZD) Authority and chairman of the Capital Market Authority (CMA). A number of VIPs and senior executives attended the event. Oman Oil Company SAOC (OOC) and Oman Society for Petroleum Service (OPAL) signed an agreement to train for employment 40 high school graduates as part of the company’s on-going Corporate Social Responsibility initiatives that focus on OOC’s commitment to the community and its continuing efforts to build the nation’s talents. Nawras will be taking part in Earth Hour 2013 for the fourth consecutive year and will be switching off electrical items wherever possible, including lighting, for one hour in support of the World Wildlife Fund's (WWF) global initiative to promote lasting actions for sustainable living. 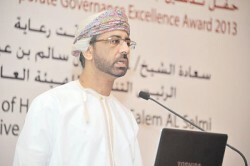 Oman Corporate Governance Centre (OCCG) of the Capital Market Authority (CMA) launched here yesterday the third edition of the biennial Corporate Governance Excellence Award for 2013 under the auspices of Abdullah bin Salem al Salmi, CMA’s Executive President. The Ministry of Education has set up a centre at Al Amerat Park for the Muscat Festival to raise awareness among children and youth about safety in general and road safety in particular. The Social Committee yesterday held its sixth meeting of the second annual sitting of the fifth term, chaired by Dr Sheikha bint Salim bin Saleem al Mesalmiyah, Head of the Committee in the presence of members of the Committee. The meeting hosted officials of the corporate social responsibility (CSR) in the private sector, such as Raysut Cement Company and Shell Petroleum Development Oman (PDO). In line with its corporate social responsibility initiatives, and the support it provides for the youth and sports activities, Oman Arab Bank (OAB) sponsored the 1st Oman Sports Expo that was held from February 4 to 6 at the Oman Exhibition Centre. This event was organised by Global Exhibitions and Conferences LLC in collaboration with the Ministry of Sports Affairs. 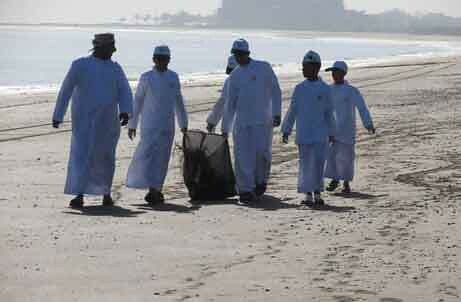 Crowne Plaza Duqm in Oman, part of Intercontinental Hotels Group is taking a firm stance on environmental issues by implementing an initiative to help maintain the ecosystem within the Al Wusta region. As part of its ongoing Corporate Social Responsibility (CSR) initiatives, the Al Hassan Group recently organised a blood donation drive at the head office in Muscat in collaboration with the Central Blood Bank of Oman (CBB).The initiative witnessed good participation from the employees in a two-day period. United Engineering Services (UES), one of the leading oilfield, marine and defence engineering services companies in the Sultanate has launched a corporate social responsibility (CSR) activity with the Rehabilitation Centres in Al Khoud. Bank Muscat, the flagship financial service provider in the Sultanate, as part of its Jesr Al Mustaqbal (Bridge to Future) corporate social responsibility (CSR) initiative, signed two agreements with training institutes in Dakhiliyah and Dhofar governorates to equip 40 young Omanis with the necessary skills to develop their careers and contribute to national development. Fund for Development of Youth Projects (Sharakah), premier organisation involved in development of small and medium enterprises (SME's) has signed an agreement with Jusoor, a corporate social responsibility entity targeted at developing the community in North Al Batinah Governorate. Bank Muscat, the flagship financial services provider in the Sultanate, as part of its Jesr Al Mustaqbal (Bridge to Future) Corporate Social Responsibility (CSR) initiative, has joined hands with LuLu Hypermarket to equip 40 young Omanis with the necessary skills to develop their careers and contribute to national development. Omantel Business Excellence SME Awards to recognise entrepreneurs in the small and medium enterprises (SME) sector were presented at a glittering function held yesterday at Al Bustan Ritz Carlton Hotel. Port of Salalah has recently won the Containerisation International Corporate Social Responsibility (CSR) Award 2012 for the company’s environmental and community focus that exemplifies corporate sector leadership in engaging its employees and local community. Omran is laying the foundation for the launch of a pioneering Corporate Social Responsibility programme that aims to empower and self-support communities in the regions where the company operates.